On the south wall of St Swithun’s church, to the right of the door, is the first of 4 funeral hatchments. These would have been displayed at the funerals of the well born, and then displayed at their houses, as part of the mourning process. It is quite usual to find funeral hatchments for members of local noble or gentry families, in older churches. This one bears the Sackville and Compton arms. The Sackville arms, red and gold with the blue ‘vair’ stripe running diagonally and a snow leopard supporter, are on the left as we look at the hatchment, but would be on a shield bearer’s right. The Compton arms are on the right as we look, but would be on the left for a shield bearer. 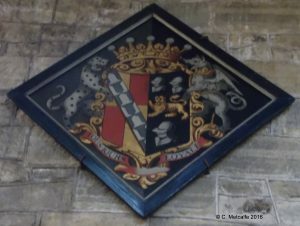 This hatchment commemorates Charles Sackville, 6th Earl of Dorset, and his second wife, Lady Mary Compton, who died before him. Charles Sackville (1643-1706) was one of 13 children of Richard Sackville, 5th Earl of Dorset (1622-77) and his wife, Lady Frances Cranfield. There is a fine monument to them in Withyham parish church, designed by Caius Gabriel Cibber. Those children who died young are depicted holding skulls. The Sackville family vault is also at Withyham church. From his mother’s family, Charles also inherited the title Earl of Middlesex. He was a Restoration courtier, poet and patron. He was a friend of Nell Gwyn, and of poets Dryden and Pope, and of Wiliam Penn the Quaker. Sackville entertained lavishly at Knole, where the accounts included: ‘85 gallons of sherry, 72 gallons of ‘Canary’, 63 gallons of white port, 425 gallons of red port’, over 6 months, plus ‘40 stones of beef, 1 mutton, 1 goose, 30 chickens, 2 pigs, 2 pheasants, 1 tongue, 1 partridge, 1 calf’s head, 105 herrings and oysters’ on a special day in 1696. Under Charles Sackville, Knole became a forum for literature and the arts. There is a story that Charles Sackville asked his guests to write pieces that would be judged by the poet Dryden. Sackville himself won, and Dryden is supposed to have been ‘charmed by the style and subject’. Sackville apparently wrote simply ‘I promise to pay Mr John Dryden £500’ and signed it. Charles Sackville served King Charles II in prestigious roles such as Gentleman of His Majety’s Bedchamber, and Lord Chamberlain of the King’s Household. One of the perks of this role was to dispose of spare furniture from Royal palaces, which is how Knole came to have a splendid collection of Stuart furniture. Charles Sackville served as Lord Lieutenant of Sussex, as MP for East Grinstead, and as Patron of Sackville College, where a copy of his portrait and of a document signed by him are on display. He was married 3 times- first to Mary, widow of the Earl of Falmouth, in 1674. Passionate love letters to her before their marriage have survived. She died in 1679, giving birth to a stillborn child. In 1685, aged 42, he married 17 year old Lady Mary Compton, daughter of the Earl of Northampton. 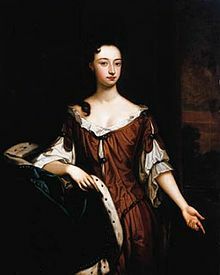 She bore him a son, Lionel Cranfield Sackville, in 1687, and a daughter, Lady Mary Sackville, in 1688, but died of smallpox in 1691, after only 6 years of marriage. In October 1704, Charles Sackville married Anne Roche, a woman ‘of very obscure connections’, and lived with her at Hampstead, then at Bath. He died in 1706. This third wife seems unlikely to have had her own coat of arms to display on his funeral hatchment. 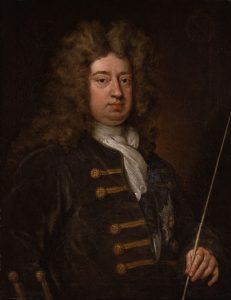 Through his second wife, Lady Mary Compton, and her uncle, Bishop Henry Compton of London, Charles Sackville became linked to the Protestant side in the turbulent reign of the Roman Catholic King James II, from 1685-88. Sackville supported the Dutch Prince William of Orange and his wife Princess Mary, daughter of James II. (They became King William III and Queen Mary II of Britain). Sackville also helped the Protestant Princess Anne (the future Queen Anne), the younger daughter of James II, to escape from Whitehall in November 1688. The Princess lost a shoe in St James’s Park, so Sackville put one of his own white gloves on her foot and escorted her to a carriage which took her to his house at Copt Hall. By tradition, Sackville’s wife lent the Princess shoes and clothes.